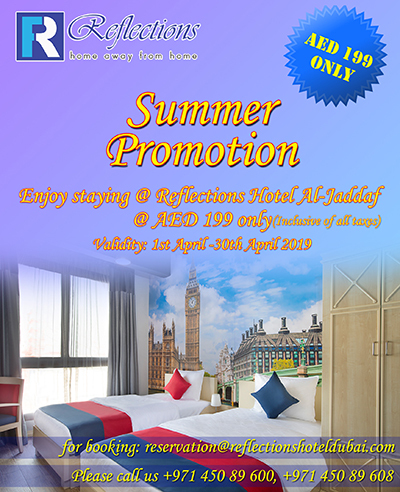 Located in one of the most dynamic destinations in the world, Reflections Hotel has been beautifully designed to reflect the cosmopolitan city that is Dubai. 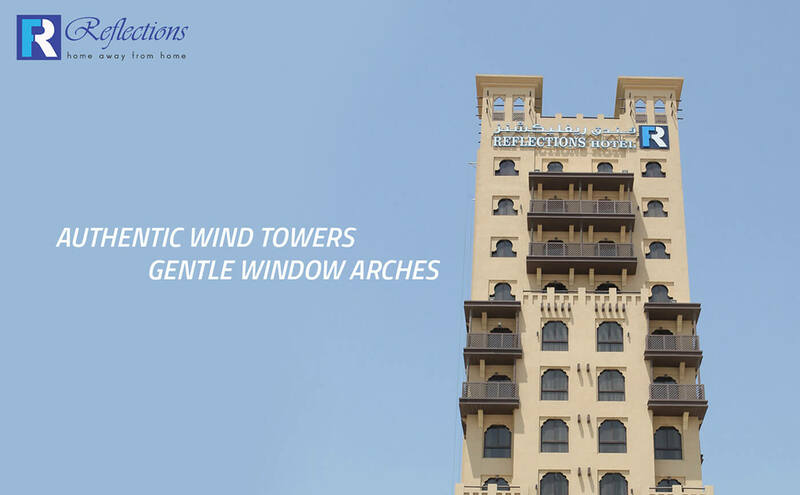 Built over 13 floors, the hotel exterior is a testament to the warmth and hospitality of Arabian Culture, showcasing the traditional design of the region from the authentic wind towers to the gentle arches of the windows. This beautifully contrasts with the interior which has been inspired by different cities. The end result is a unique property that offers every guest a “Global” experience, situated in one of the most up-and-coming locations in Dubai. 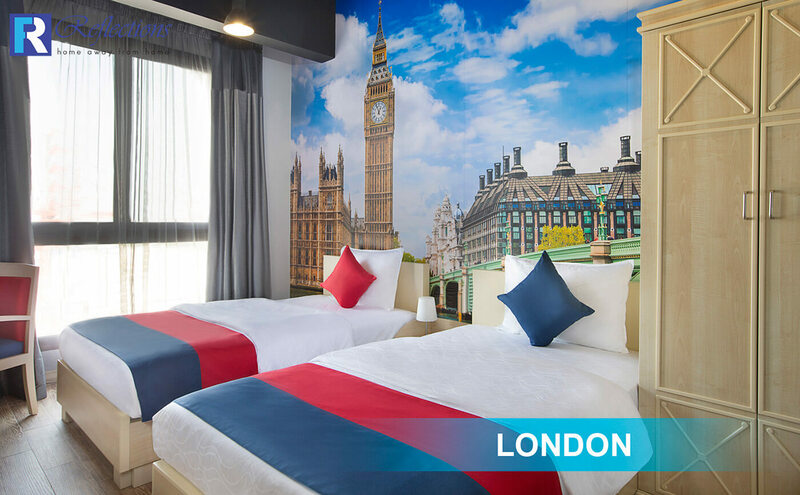 The hotel offers 100 rooms ranging in size and style – with a choice of immaculately appointed Superior and Deluxe Rooms, luxurious Burj Suites and extremely spacious 1 Bedroom Suites. 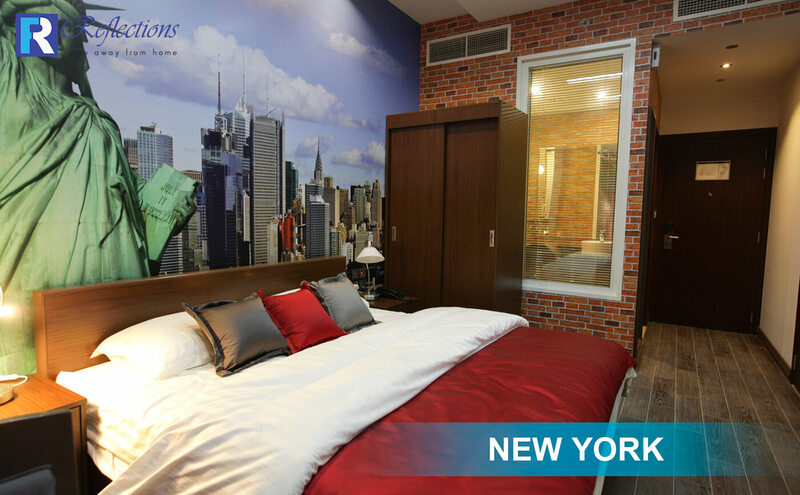 vibrant, pulsating and dynamic, each New York inspired room features a wall of incredible artwork that represents the excitement of the Big Apple. 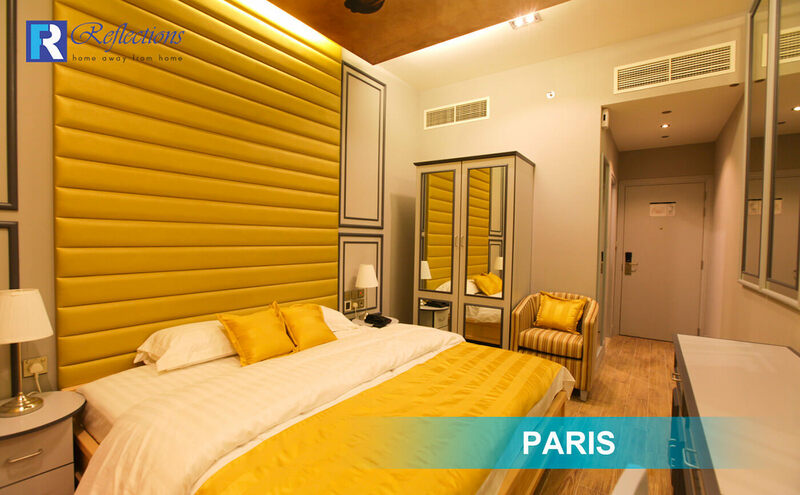 Striking modem-day design meets traditional decadence in these Parisian-styled rooms. 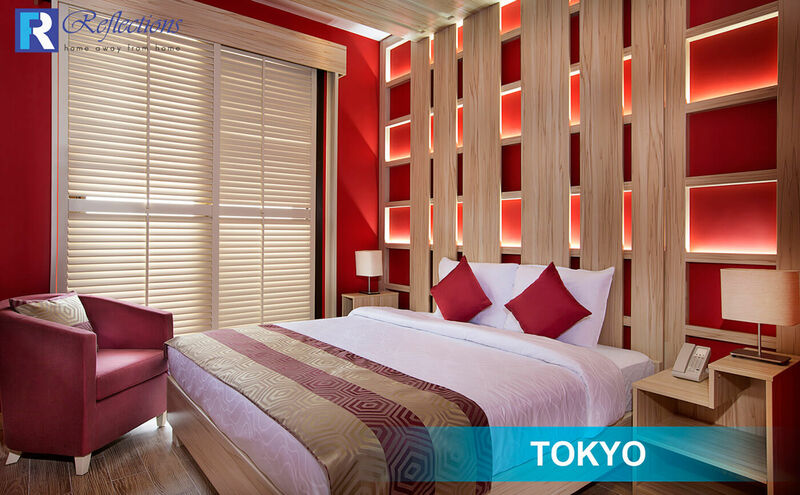 with its clean lines and light, inviting décor, feel the serenity of these Japanese-inspired quarters that demonstrate the traditional of this incredible city. Reflecting the urban electric ambiance that makes up this dynamic capital, bold colors of red, white and blue mix with a warehouse feel backdrop for an incredible setting. 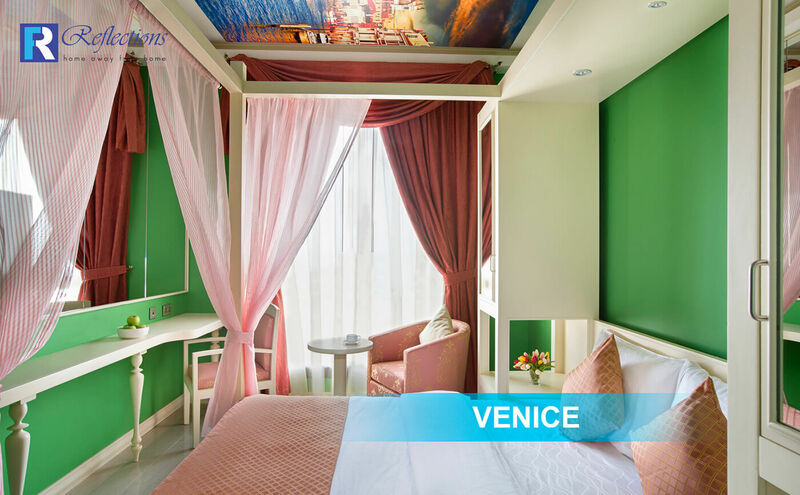 Showcasing the beauty and charm associated with this historical city, the Venetian rooms will transport guest to an Italian setting made up of romance and art. 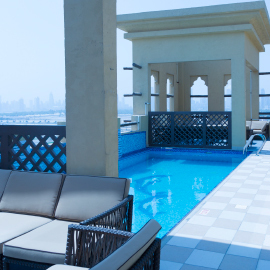 Reflections Hotel aims to provide you with all the amenities required as a home away from home for your visit to Dubai, and more. 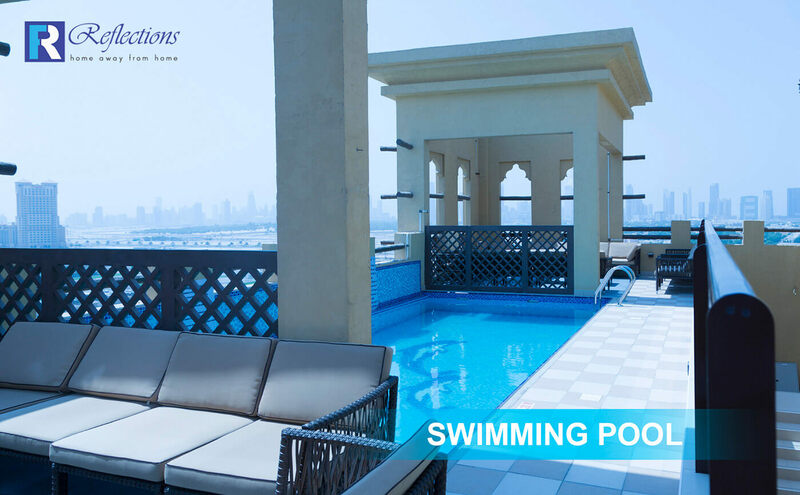 You won’t be able to go past a dip in our rooftop pool – float your cares away marvelling at the majestic and uninterrupted views across Dubai. 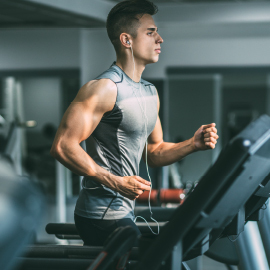 If you need your fitness fix – Reflections Hotel Hotel provides guests with a comprehensive fitness centre complete with modern work-out equipment, jacuzzi, sauna and steam room. Reflections Hotel offers comprehensive meeting, banquet and conference facilities to suit all your meeting and events needs. Our function rooms can accommodate events including a small boardroom style meeting through to a cocktail function for 100 guests. 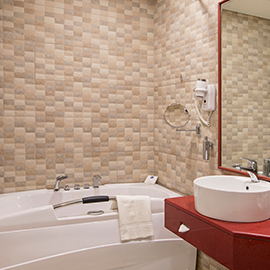 The hotel also offers a business centre ensuring that secretarial and business support – from computers, printers and scanners to high-speed internet access, photocopying and faxing facilities – are readily available. 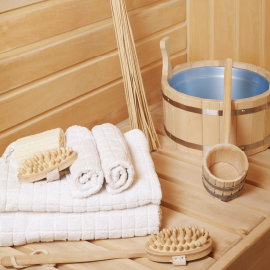 Reflections Hotel Hotel offers extensive facilities, a friendly and experienced team and inspiring surroundings to relax, release stress and rejuvenate. 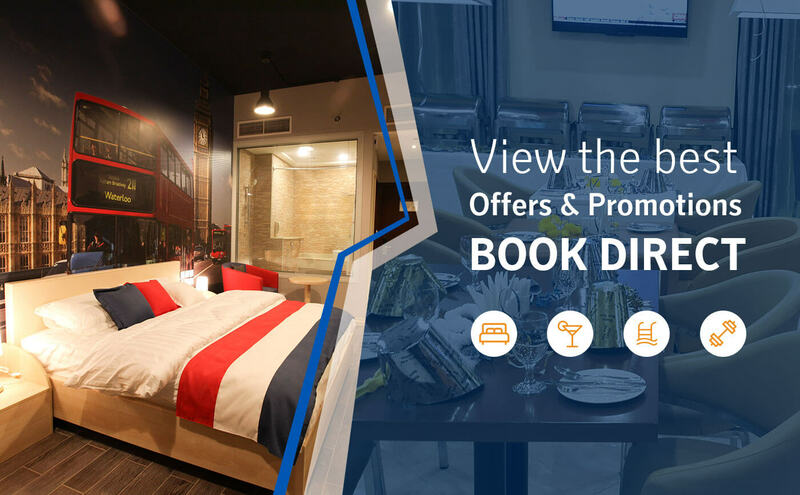 Guests will be impressed with a diverse range of dining options at Reflections Hotel Hotel. Whatever your mood - you are sure to find something to satisfy your taste.